In January 1, 2019, Hawai‘i became just the seventh state in the US to permit medical aid in dying. The Our Care, Our Choice (OCOCA) law allows terminally ill adult patients with capacity to make medical decisions to be prescribed an aid-in-dying medication if all the requirements are met. Patients who qualify must have received a terminal diagnosis of six months or less; request the OCOCA prescription directly; and be 18 years of age or older, mentally capable of making the decision, and able speak for themselves. The patient must also be physically and mentally able to take the drug themselves. Gov. 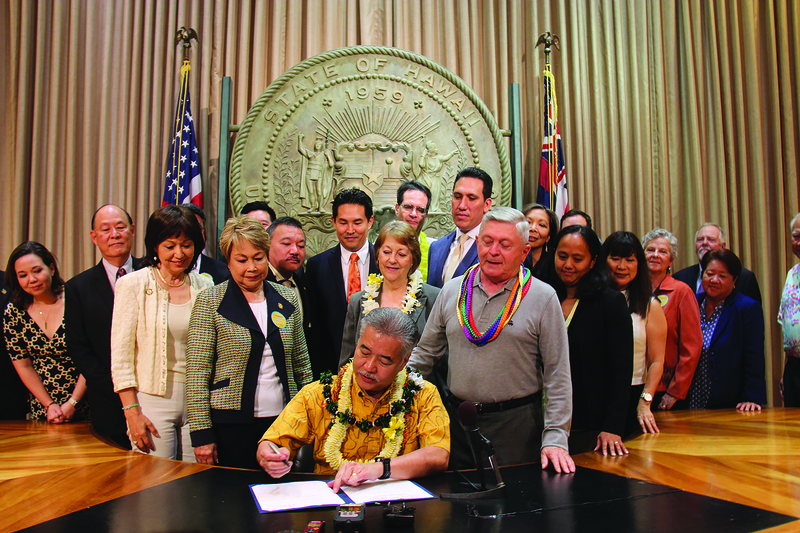 David Ige signs the Act into law at a ceremony with supporters. Hawai‘i’s version of the law also requires patients and their physicians to go through numerous steps before an OCOCA prescription can be written. Physicians are required to talk with patients who request the prescription about alternatives or additional treatment opportunities, such as hospice care, pain management and palliative care. Executive Director for Kōkua Mau, Jeannette Koijane, says, “Like the Hawaii Department of Health, we recommend that anyone who has a diagnosis of six months or less to live enroll in hospice and work with the trained hospice team that will address physical, emotional and spiritual suffering.” Kōkua Mau is a network of organizations and individuals that work to improve care especially for those with serious illness and at the end of life. Under Hawai‘i law, patients cannot be denied health insurance, life insurance, or annuities because they are participating in OCOCA. Taking the drug will not be viewed as suicide, assisted suicide, homicide, mercy killing, or other criminal conduct under the law. Insurance plans are not required to cover the OCOCA prescription. Contact your health plan for details. Medicare will not cover the drugs. Learn more about the OCOCA law. Go to the Hawaii State Department of Health website at http://health.hawaii.gov/opppd/patients-family-and-care-support/.